Today in an era of cut throat competition, an organization can survive only if it is a quality organization and respecting the basic concept of quality. In fact, quality is the single most important issue which an organization faces every day of its existence. A reputation for quality is essential for the future of the organization. An organization to become a business leader has to ensure that it does everything in the organization where quality work can flourish and where quality becomes a competitive advantage. Quality improvement can happen in the organization if all the employees (from top to bottom) have a shared dedication towards quality with all its functions. Organizations, which are not quality conscious, are normally product oriented. In these organizations the emphasis is on detecting errors. The responsibility of maintaining the product quality lies with the quality control department and the problem solving is normally done by a few people in the authority at the top of the pyramid. These types of organizations are successful when the environment conditions favour them. Quality conscious organizations are those which have faith in quality principles. These organizations are customer oriented and focus on preventing errors. They balance short term objectives with the long term objectives. These are the organizations which survive even in most adverse environment. Quality conscious organizations are generally supported on five pillars of quality. Three main ingredients for the five pillars in a quality conscious organization are as follows. There must be a clear understanding of what is already in place, what is working well and what can be enhanced as the pillars of quality become central to every employee’s daily work. There must be vivid sense of where the organization wants to go. Organization should have a vision for the future instead of goals and targets for the coming years. Visions are beacons to guide everyone in the organization. There has to be a comprehensive plan which is a set of guidelines governing progress in the overall implementation process. This plan is to be a living document which must be reviewed, updated and changed to reflect the changing environment, growing capabilities and the changing need of the organization as it implement the quality principles. A quality conscious organization has got five characteristics. These characteristics are called the five pillars of quality (Fig 1). 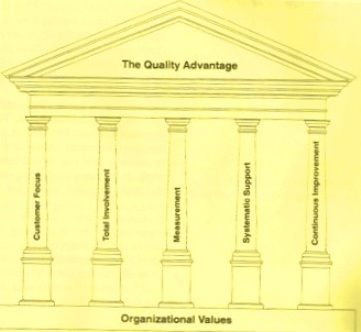 The foundation of these pillars is the organizational values since the pillars get support from these values. These values are honesty, commitment to customer satisfaction and commitment to creating an environment in which the employees can give their best to the organization. The five pillars of quality are described below. Customer focus – An organisation depends on its customers and therefore should understand current and future customer needs. It should not only meet customer requirements but also should strive to exceed customer expectations. Further within an organization, employees supply products, services and information to one another. These exchanges link co-employees as internal customers and suppliers (Fig 2). The organization can better meet the need of its final external customers when it also works to meet the requirements of its internal customers. Employees within the organization must understand the requirements of all their customers and continue to meet the requirements while working to improve their work processes. Total involvement of employees – Quality is not just the responsibility of management or quality control personnel. Quality efforts are to involve virtually every employee of the organization since improving of quality is the job of everyone in the organization. Employees at all levels are the essence of an organization and their full involvement is necessary to enable their abilities to be used for achieving the quality improvement objectives of the organization. In an organization the unrecognized quality experts are those personnel who do the work. They are best equipped to solve the quality related issues. In an organization it would be a mistake to solve quality problems without the ideas and advice from these unrecognized quality experts. Measurement – An axiom of quality is,”You can’t improve what you don’t measure”. An organization needs to track its progress using measurement. When people learn to measure quality, they know where and when to take action. They will also be able to document the achievements that result from the quality improvement process. An organization can meet its quality goals if it establishes baselines and charts progress against them. Decision what to measure and who will measure, should be heavily influenced by customer requirements. Normally measurement is to be done by those persons who are closest to the work. Also in a quality conscious organization, people make decisions using facts and data then relying on intuition. Systematic support – Slogans have their place, but serious quality improvement begins when all the support systems in the organization such as strategic planning, budgeting, scheduling and performance management reinforce the quality improvement effort. Coordinating systems can reduce the time it takes to get work done. Quality is to be recognized and rewarded. If an organization is not willing to promote and reward those who improve how the work is done then it will not achieve quality. Continuous improvement – There is always room for improvement and there always will be the possibilities of improvements. The quality organizations are always aware of their potential to be better. In these organizations “good enough” is never good enough. To build and maintain a quality advantage, people must continuously reach for new and better ways to do their jobs. An organization needs to do things better tomorrow than it did yesterday and to be constantly on the lookout for ways to prevent problems, correct flaws and make improvements. In a quality organization, everyone foster creativity and breakthroughs and increase credibility with their customers. Even if the customers are satisfied with how the organization serves them now, it is better to keep looking for a better way. In a fast changing world, it is only a matter of time before the customers need change. When they do, organization must be ready to maintain their competitive advantage.